Lalu Nathoy’s father calls his thirteen-year-old daughter his treasure, his “thousand pieces of gold,” yet when famine strikes northern China in 1871, he is forced to sell her. Polly, as Lalu is later called, is sold to a brothel, sold again to a slave merchant bound for America, auctioned to a saloon keeper, and offered as a prize in a poker game. Complete with photographs and documents, this biographical novel is the extraordinary story of a legendary pioneer’s fight for independence and dignity on the American frontier. In Chapter 8, Ding says to Lalu, "Don't you understand, you cannot escape your fate?"(p.77). How does this book embody the debate on predestination vs. determining one's own future? 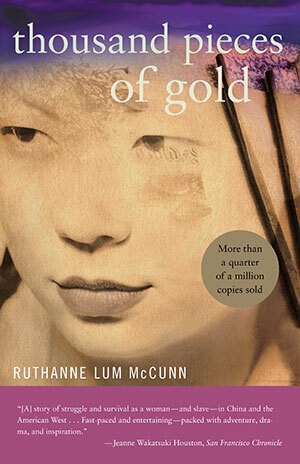 Discuss the various meanings behind the title, "Thousand Pieces of Gold." Do you think it is an appropriate title for this book? Do you think the author presents a realistic portrait of race relations in a small, yet polarized American community? How about the role of women in a largely male community? Discuss how you think it feels to be a minority in a similar situation. "For the Gold Mountains they had described was not the America she would know. This: the dingy basement room, the blank faces of women and girls stripped of hope, the splintered boards beneath her feet, the auction block. This was her America."(p.102). This small passage touches upon the idea of the American Dream' and how reality is often very different than immigrants imagined it to be. Do you think immigrants still experience these same feelings in America today? Describe your own personal experiences. During the course of the book did you ever think Lalu fit into the role of a China doll?' If so, when does her status start to change and what events contribute to her eventual liberation? Charlie speaks of the limitations Lalu will have as a Chinese person living in 19th century America. Besides her decision to not have children, in what other ways does Lalu show that she is aware of these limitations? To what degree does Lalu loosen her ties with her Chinese background? Mention some examples from the book. Does Jim's concern for Lalu match the brief relationship she had with the bandit Ding? How do the two relationships differ? Lalu is told by Charlie that a Chinese person in America cannot own land. Considering Lalu's love of farming and land, does she ever accept this concept? Give examples of her defiance and perseverance. Is Charlie's and Lalu's relationship similar in some ways to the one Lalu formed with her father when she worked in the fields of northern China? "And when you became of age, your mistress would have found you a good husband, and you would have been free again. Now you are neither snake nor dragon. You are a woman, yet you work like a man, a laborer. Who will marry you?" (p.356). Discuss the daily discrimination Lalu faced in China and how it differed from the discrimination she faced in America.